A former World Championship leader and World Cup winner is among Panthers’ targets to complete the team they hope will challenge for Premier League glory in 2016. 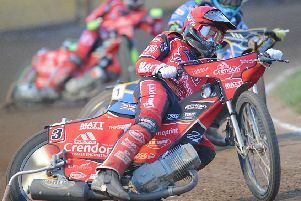 Promoter Ged Rathbone has confirmed to the Peterborough Telegraph that the city club have held talks with Danish star Kenneth Bjerre about a possible return to the East of England Showground. Bjerre has spent much of his British career in Panthers’ colours after representing them in seven seasons during the Elite League era. He is one of three past Panthers riders who have been contacted about being a potential number one rider for the club next season. Swedish veteran Peter Karlsson and Polish star Norbert Kosciuch are others to have come under consideration from club bosses. But Rathbone revealed that drafting in any of the above riders will depend on how Panthers’ fixtures – many of which are likely to be on Sundays - fit around those of clubs in Poland on the same day and where the trio have already struck deals. Rathbone said: “We have spoken to Kenneth in depth about the possibility of him being a Peterborough rider next season. “In fact we have been in contact with several riders in our search for a number one, and Peter and Norbert are also among them. “They have all expressed their interest in riding for us, but it will depend on how our fixtures fall around their Polish commitments. “We have just received the first draft of our fixtures and we hope to have them finalised very soon. Once that happens we can continue discussions with the riders on our radar. “I’ve said all along that it is a case of having to be patient. We’re in a position where we need to make the right signing rather than a quick signing. “I’ve been made aware of some nonsense on internet forums which suggests we cannot afford to sign a number one. “Let me quash that straight away and let me also assure every single one of our supporters that we have the finances to put together a package to attract any of our targets for the number one spot. Bjerre saw his Elite League average drop to 5.87 during a tough campaign at King’s Lynn, but that could work out to Panthers’ advantage as it makes him eligible for the Premier League as he has dropped under the six-point threshold. Bjerre would come into the Panthers side on an 8.22 figure as a rider’s Elite League average is multiplied by 1.4 to determine a Premier League mark. Karlsson, still going strong at 47 years of age, raced for Panthers in two Elite League seasons and has spent more than half of his 25-year British career with parent club Wolverhampton. His top-flight average dropped to 5.51 last season which would translate into a 7.71 figure for Panthers. Kosciuch was a popular figure with Panthers fans in more recent times as he rode for the club in four successive seasons earlier this decade. He operated at either reserve or second string in the Elite League, but would almost certainly be a powerful rider in the Premier League where he would race off a 7.07 starting average. That would see Panthers come in well under the 42.50 points limit as they have 8.45 available for their final rider.